Everal Hannah Morgan was the Youngest child of Thomas Morgan and Ann Watkins. Everal Hannah is shown above with her husband Daniel H. Radford in a picture taken in 1897 or 1898. Daniel H. Radford was a son of John Whitlock Radford and Rachel Leah Smith Radford and a brother to Nancy Jane Radford, who married Thomas Morgan. Back Row, standing, L-R: Daniel H. (Dee) Radford (1881-1951), James William Radford (1879-1942), George Henry Radford (1885-1968). 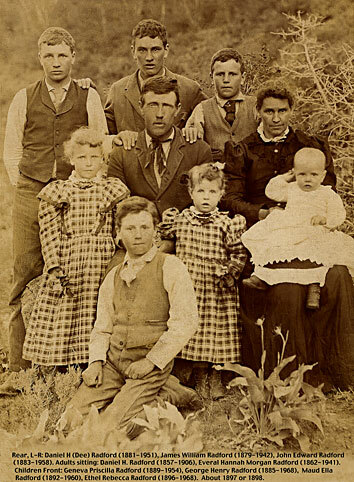 Middle Row, sitting: Daniel H. Radford (Father) (1857-1906), and Everal Hannah Morgan Radford (1862-1941). Front Row-The three girls born last-are, L-R: Geneva Priscilla Radford (1889-1954), Maud Ella Radford (1892-1960), Ethel Rebecca Radford (1896-1968). Life Sketch for Everal Hannah Morgan and her husband Daniel H. Radford. Extracted from a life history of Daniel H. Radford and Everal Hannah Morgan Radford written by Vera LaVona Radford Haskell (The daughter of Daniel and Everal's son George Henry Radford). Vera says "Although grandfather passed away two years before I was born, grandmother, dad and mother related these facts to me........"
Everal Hannah Morgan Radford was the eighth and youngest child of Thomas Morgan and Ann Ollen Watkins. She was born in Goshen, Utah, 27 June 1862. Daniel H. Radford was the sixth of seven children born to John Whitlock Radford and Leah Rachel Smith. He was born in Fillmore, Millard, Utah, 6 March, 1857. Daniel's sister, Nancy Jane Radford, married Thomas Morgan and his brother, John Franklin Radford, married Everal's sister Priscilla Morgan. James William Radford, born 29 April 1879 in Leamington, Juab, Utah. He was married to Mary Jane Carpenter 26 June 1906 and he died 30 January 1942. Daniel H. Radford (Son), born 26 March 1881 in Leamington, Juab, Utah. Married 6 March 1906 to Ada Melissa Morgan. He died 29 May 1951 at the age of 70 at Osgood, Idaho. John Edward Radford, born 30 Jan 1883 in Leamington, Juab, Utah. Married to Eva Teeples 6 April 1905. He died 15 January 1958 at Idaho Falls, Idaho. George Henry Radford, born 11 February 1885 in Leamington, Juab, Utah. Married 4 Sept 1907 to Martha Elizabeth Spracher. He died 17 Feb 1968 at his home near Ririe, Jefferson, Idaho. Geneva Pricella (Priscilla?) Radford, born 4 July 1889 at Salt River, Lincoln, Wyoming. Married 4 Sept 1907 to Albert Askew. She died 26 1954 in Oakland California at 65 years old. Maud Ella Radford, born 11 May 1892 at Shelton, Idaho. Married Andrew Jackson Ross 6 Jan 1912. She died 21 Oct 1960 in Idaho Falls at the age of 68. Ethel Rebeca (Rebecca?) Radford, born 11 June 1896 at Shelton, Idaho. Married (1) Lawrence Leonard Scott in April 1915 and alter (2) Lawrence Johnson. She died 20 March 1968 in Blackfoot at the age of 72. In the year 1899 Daniel and Everal Hannah bought a farm in East LaBelle, Idaho. They lived there for a number of years before going to Hailey where Daniel worked at the "Minie More Mine." One summer they put in crops near Fairfield at Mormon Reservior, the crops failed because of shortage of water and they came back to LaBelle. In 1906 Daniel filed on (Homesteaded) a farm in Rudy (Later Ririe) Idaho. He built a two room log home where he died that same year (1906). He was 49. After Everal became older her son George Henry Radford rented her farm and later bought it. Everal was living with her son Daniel (Dee) Radford (Who had married her brother William Morgan's daughter Ada) when she passed away 10 March 1941 at Osgood, Idaho. She was 79. Description of her death: "Grandma was enjoying fairly good health the morning she passed away. She arose and went outside before the others had gotten up. She went back into the house and to the kitchen stove, moving a lid or two. Uncle Dee called to her, 'Never mind mother, I will make the fire.' She went back to bed and sat on the edge. In a while she called to Uncle Dee and Aunt Ada, who came to her side. They tried to lay her down in bed but to their amazement she was stiff and cold. They couldn't do much with her and in a few minutes she drew her last earthly breath in their arms." Click on the link above to see a picture of Everal Hannah Morgan Radford with four of her children. Click on the link above to see a picture the the gravestone in the Shelton, Idaho cemetery for Everal Hannah and Daniel Radford.